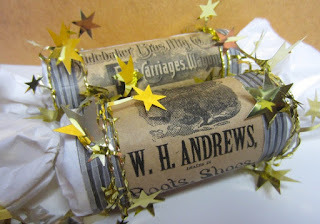 Crackers are decorated tubes filled with toys, trinkets, candy, confetti, and many times, tissue paper crowns. They can be put on dinner plates or a table setting at a meal, or handed out at a party. The recipient can either pull on both ends of the cracker, or one person can pull one side and another person pull the other. Either way, when opened, confetti and other items come spilling out. There are several ways to design them but I prefer this simpler method. Embellishments to tie at the cracker ends– this can include curling ribbon, twist ties (i.e. I snipped some gold ones from the end of a holiday decoration), string, wire, or twine. 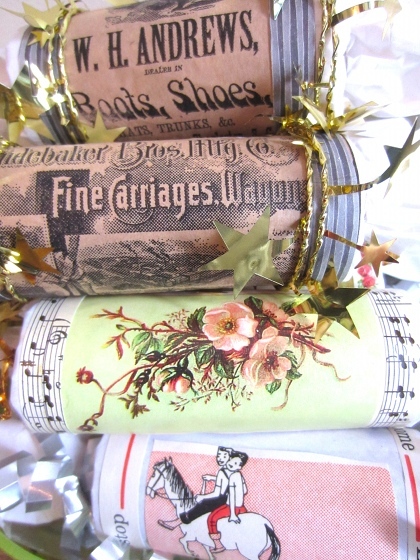 Things to put inside the crackers. For adults you can include candies, lottery tickets, fortunes, and confetti. For children you can include trinkets or toys, confetti and candies. Cut the tissue paper into 10-12″ length. Some people prefer crackers to have shorter ends, some prefer longer ends. 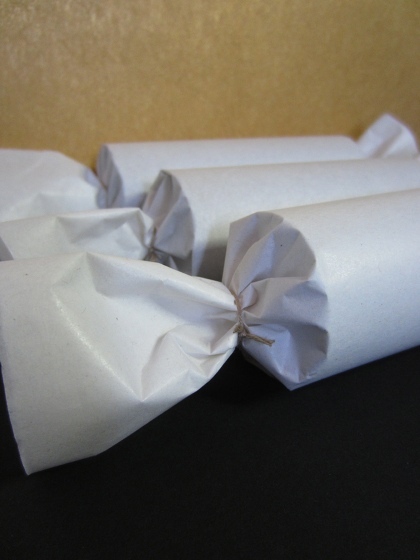 Place the cardboard tube in the center of the tissue paper and wrap the tissue around the tube. I use a piece of tape to secure one end of the tissue paper to the tube then roll the tube till it is covered with tissue paper. I then secure the tissue paper in place with another piece of tape. I trim any excess tissue paper as needed. Use a piece of string to tie one end of the cracker. 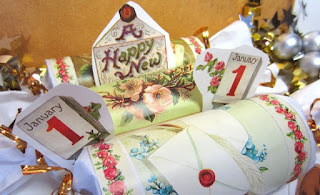 Now that one end of the cracker is secured, fill the cracker with the items you set aside for filling them. Tie the other end of the cracker with string. 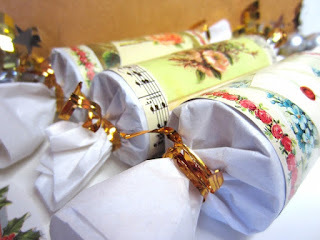 Decorate the crackers by wrapping them in colorful, patterned, and/or recycled papers. You can cut thin strips of paper for the edges, longer and wider strips for the centers. Decorate the ends of the crackers by adding festive wire or twist ties, curling ribbons, wired garlands, or twine.